Motor solutions for AGVs must be lightweight and compact with high power density and energy efficiency at the same time. 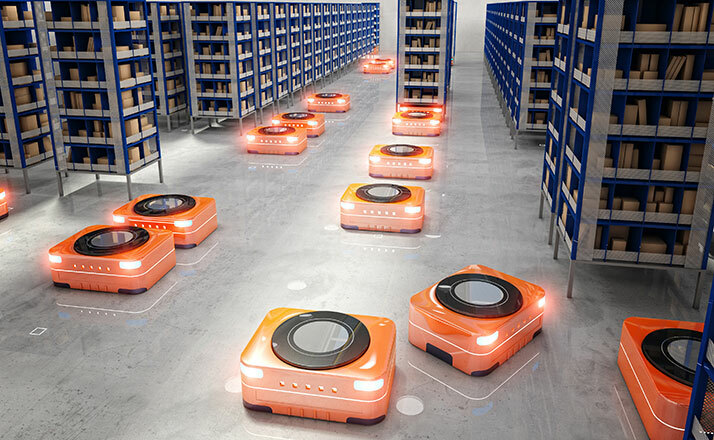 Especially, the increasingly smaller shuttle vehicles used for distribution systems in warehouses contain little available space for these drives. In accordance with the requirements of the AGV manufacturers, the gear manufacturer Framo Morat from Eisenbach and the motor manufacturer Dunkermotoren from Bonndorf have developed and implemented a particularly compact DC drive system. A hub gearbox has significant advantages regarding lifetime, reliability and noise compared to the often-used wheel and toothed belt drives. This is the first time that this gearbox design has been used in a drive system for an AGV. In this gearbox type, the drive shaft and output shaft are arranged coaxially, one inside the other. A planetary gearbox transmits the torques between the drive and the output shaft. The motor convinces with a combination of compact smart EC motors with integrated electronics and all established fieldbus and Ethernet interfaces. The integrated electronics allow, for example, complete driving profiles to be stored and retrieved. The drive unit is available with a nominal voltage of 12 – 60 V with an output torque of up to 350 Nm. The drive units are configured according to customer requirements. At the same time, by using an existing modular system with standardized components, short delivery times and economic investments can be ensured. The outer contour of the output shaft and the torque support is customized individually, for example with standard toothing for toothed belts, customer-specific shaft-hub toothing or as a smooth shaft with flange bores for a wheel rim. Framo Morat develops and manufactures a wide variety of drive components for various applications in the area of storage and conveyor systems technology.